This made a pretty tasty lunch today! 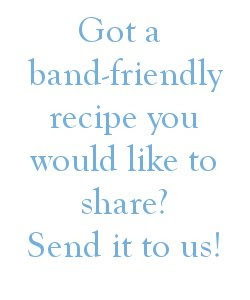 Welcome to Bandfriendlyrecipes.com! Here is a collection of my favorite band-friendly meals. Not only are they great for those who have a gastric band, but they are also family-friendly and sometimes even kid-friendly. Most of all, they are healthy, low calorie, low carb recipes that anyone can enjoy. Disclaimer: I suppose I need one of these... Please follow your doctors orders. I am not a doctor or a dietitian, nor do I claim to be. And just because I can eat something doesn't mean you can! I am just a bandster trying to help others find recipes. All recipe calorie calculations are consistently calculated at SparkPeople.com. Did I mention...Follow your doctors orders? I suppose I need one of these... Please follow your doctors orders. I am not a doctor or a dietitian, nor do I claim to be. And just because I can eat something doesn't mean you can! I am just a bandster trying to help others find recipes. All recipe calorie calculations are consistently calculated here. Did I mention, LISTEN TO YOUR DOCTOR?